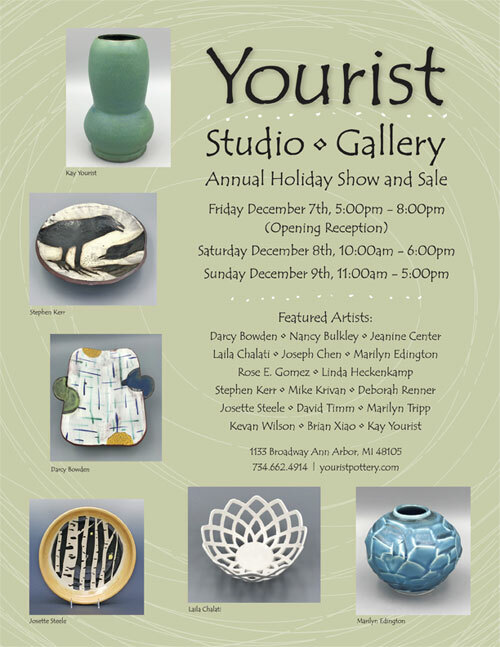 Start your holiday celebrations with a visit to the Yourist Studio Gallery Annual Holiday Show and Sale . We launch with a festive Opening Reception on Friday, December 7th, from 5:00 to 8:00pm. Our Show and Sale continues on Saturday, December 8th, from 10:00am to 6:00pm, and on Sunday, December 10th, from 11:00am to 5:00pm. You'll see a wide range of beautiful ceramic ware— from bowls, plates, butter dishes, cups, and mugs to tea pots, trays, vases, and more— lovingly created by hand by our Resident Artists and selected students. You're sure to find gifts that will give your loved ones pleasure and joy for years to come. And maybe a choice piece or two for yourself.
. . . almost gone . Sign up by December 5 for winter 2019 classes to take advantage of our Early Bird Enrollment Discount of $10 off the tuition price. This discount applies to all introductory and advanced classes of six weeks and longer. 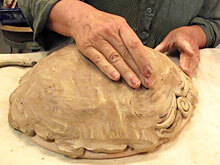 By popular demand, we've added a second helping of our Coffee and Clay hand building class with Nancy Bulkley on Wednesday mornings , from 9:30 to 11:30 am, starting January 9. Now you have double the opportunity to take this excellent class. Sun, Jan 6-Feb 10, 1:30-3:30 pm, with David Timm. Sun, Jan 13, 9:30 am-12:30 pm, with Darcy Bowden. See details below. 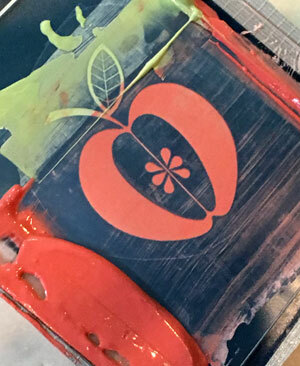 A mini-workshop for those who have taken the August or October silk screening workshop. This followup session offers you more practice and reinforces your workshop learning. 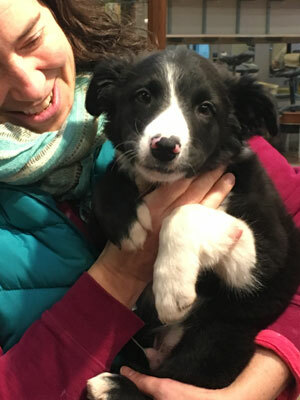 Meet Finnegan . . .
. . . our newest, and dare we say most adorable, potter in training. Finnegan is a Border Collie and Aussie mix, a dog with strong herding instincts. To learn how to respond, be sure to read Kay's training rules for Finnegan, which are on display at the studio. from Finnegan and his people! The studio and gallery will close at 1:00 pm on Monday, December 24. We will reopen for regular hours at 10:00 am on Saturday, January 5. Remember, the studio will be unavailable for any clay work during the Yourist Studio Gallery Annual Holiday Show and Sale from December 7-9. Please put down your pottery tools and come join us at the show. ﻿To free our shelves for new bisqueware, we must discard any unclaimed bisqueware remaining after these dates. Keep in mind that these schedules could change if we don't have enough pieces to fill the kiln. Check with the studio for the latest schedule. ﻿ Tool Time has left for an undisclosed island in the sun over the holidays and will be back after the beginning of the new year . Be sure to check our February issue for topic and time. Meanwhile, if you have topics you'd like Kay to cover in her free Tool Time demonstrations, please let her know . We're interested in hearing from you. Q. When I make mugs, I like to use a liner glaze on the inside and a different glaze on the outside. To glaze the outside, I usually stuff my fist inside the mugs and dip, but I find this method awkward and messy. Is there a neater way to do the dip? A . Potter and software engineer Jeremy Smoler had the same problem. 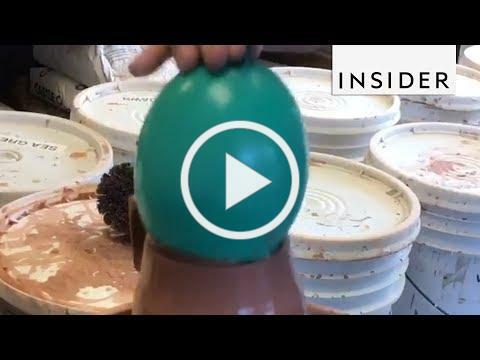 As Smoler demonstrates in this video, he solved it by using balloons to dip the outsides of his mugs in glaze without getting the glaze on the inside. View examples of Smoler's finished work here. 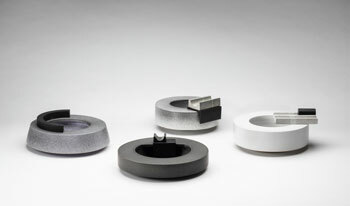 Breaking With Tradition: Contemporary Ceramics . Now-January 27, 2019. Harris–Burger Gallery, Flint Institute of Arts. More . . . 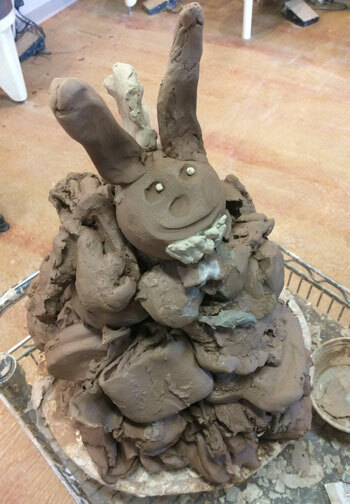 Animal Friends: Ceramic Sculpture by Marcia Polenberg. September 17- December 7, Taubman Health Center. More . . .
Table Top Stories. Curated by International Museum of Dinnerware Design, December 3, 2018–January 9, 2019. Ann Arbor District Library, Downtown Branch. More . . .
Annabeth Rosen: Fired, Broken, Gathered, Heaped . November 17, 2018– March 10, 2019. Cranbrook Art Museum. More . . .
Ian McDonald: In No Particular Order. January 19-March 10, 2019. Cranbrook Art Museum. More . . . Butter . April 6–August 25, 2019. 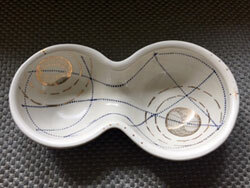 Third Biennial National Juried Exhibition presented by the International Museum of Dinnerware Design. Museum on Main Street. More . . .
Yourist Gallery artists Darcy Bowden and Linda Heckenkamp join five other local artists in a Holiday Show and Sale Saturday, December 1, from 11 am-6 pm, and Sunday, December 2, from 11 am-5 pm. 1311 Brooklyn Street, Ann Arbor. Ann Arbor Potters Guild Winter Sale , December 1 and 2, 10 am-5 pm, 201 Hill Street, Ann Arbor. Yourist Gallery artist Nancy Bulkley exhibits at the Winter Artist Market , Matthaei Botanical Gardens, Sunday, December 2, from 10 am to 4 pm, 1800 N. Dixboro Rd. Ann Arbor. Is it a sculpture? Is it a vase? It's both! 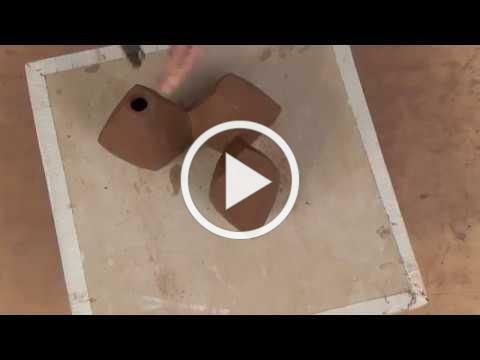 In this video from Ceramic Arts Network, potter Jerilyn Virden shows how she hand builds three graceful forms and then attaches them to make a vase that is both functional and sculptural. See more of Virden's functional work and sculptural work .